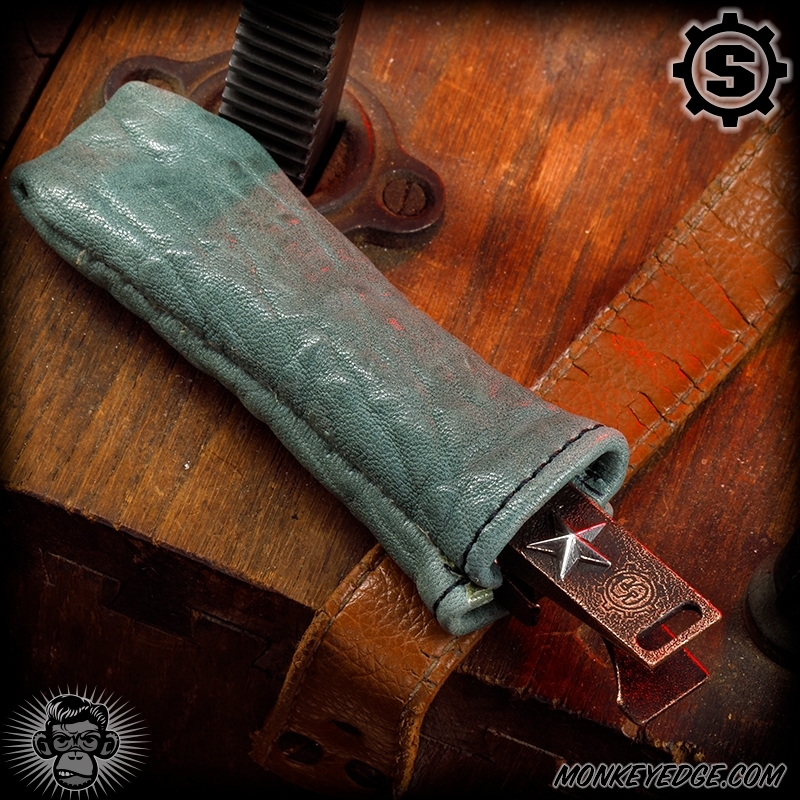 This custom Church Key features a cool hand textured with blackened patina finish and buffed highlights. Custom one-off done featuring a silver Slickster, and brass and silver star badges! Comes with stitched leather goblin scrotum bag. tem·per·ance noun - moderation or self-restraint, especially in eating and drinking. Got the blues? Got the shakes? Can't get into your 'medicine' for relief? 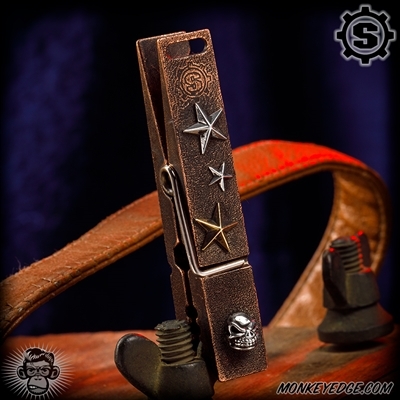 Well, Professor Maverick has just the tool you need: The 4 in 1 Church Key! Clip it to your gear and its custom designed, manufactured in the USA, stainless steel spring will keep it there till ya need it. But that's not all ladies and gents! After all, it is the '4 in 1' church key! Lanyard tie off point to keep your key near you, or to lash to your other gear and use the clip to keep it secure. Ever so clever line opening just so happens to have six sides to hold your hex drive bits. The side has a 3 1/2 inch measuring scale for measuring stuff. AND seeing as how most jurisdictions allow blades 3 inches and under, what better way to show Johnny Law that you are within the limits? Each piece is precision machined in the USA from US sourced, high grade, brass alloy. You don't just open the MSC catalog and find high quality, US made stainless steel clothespin springs, so the spring was designed from scratch and custom made to spec in the USA. Each piece of this limited run is hand stamped with the Maverick Monkey Logo and hand stamped with its serial number. If you remember, the clothespins you had as a kid could twist apart. 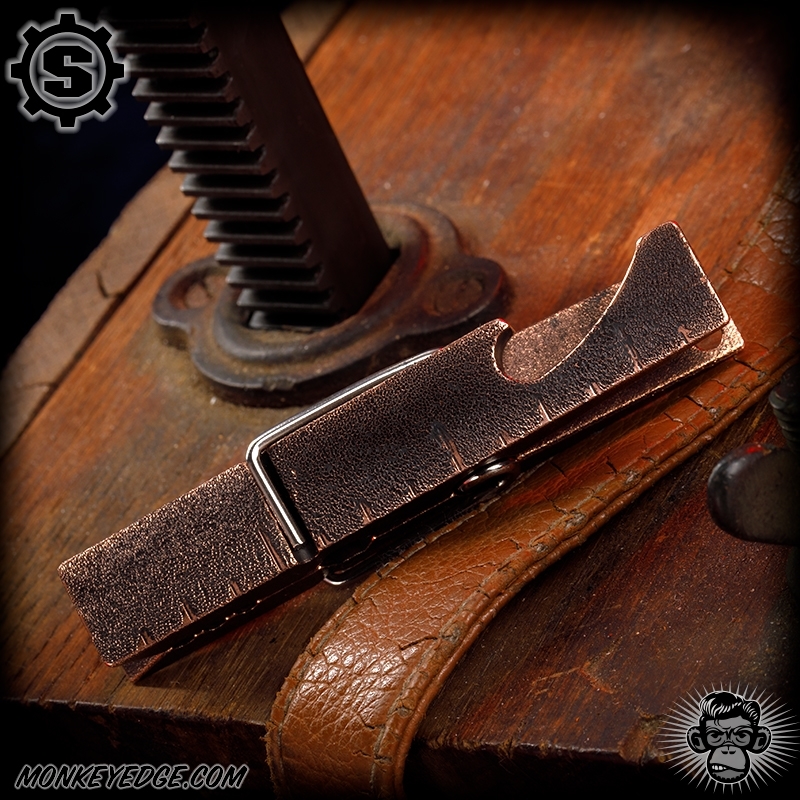 Well, the Professor Maverick's 4 in 1 Church Key features Anti-Twist Tech. There are a series of grooves with precision tolerances that allow the key to open and close, yet eliminate side to side movement making your Church Key strong and good to go!